Magnecor’s KV85 Competition (8.5mm)Ignition Cables feature Magnecor’s exclusive 2.5mm high capacity Metallic Inductance EMI Suppressed conductor consisting of stainless steel wire precisely wound at 200 turns per inch over a ferrimagnetic core. The insulating jacket is made entirely of Magnecor’s exclusive TC-1500-HS high strength aerospace grade silicone rubber, and its single layer construction will prolong the jacket’s insulating ability by conducting extreme heat away from hot-spots that occur near over-the-limit heat sources. 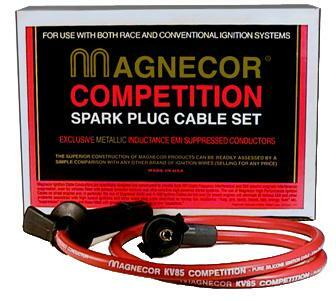 All Magnecor KV85 Competition 8.5mm Plug Wires are Red in color.